This history of Paris American High School from its origin in 1951 to its last days in 1967 is designed to be a “living” document. You are invited to add your memorable experiences, favorite teachers, key events, class activities and similar bits and stories under your graduation year group. When you do, please begin your remarks by including your name and class year at the beginning of your contribution. Thank You! The Department of Defense started operating American military schools in some overseas locations beginning on October 14, 1946, for the children of military personnel stationed at a wide variety of countries overseas. The intent was to ensure an American educational experience for the American student. Therefore, the children and educational program were and still are American, however, some faculty members were non-English teachers employed to instruct foreign languages and similar subjects. In 1946, enrollment of a military child in a DOD school cost $10 ($125 in 2017 dollars). The schools received operational funds from profits made by the sale of alcohol at Class VI stores which were located on each post or base. In 1946, the Department of Defense Dependent Schools (DODDS) was created for dependents of military members of the armed forces in overseas areas. After World War II, the increased demand for American education overseas was a result of the government's decision to allow military personnel to bring their families with them when they were deployed to overseas locations. By 1949, almost 100 schools were being operated separately by the Army, Navy, and Air Force in countries around the world. In 2011 there were 120 schools. With the closing of Heidelberg High School in 2012, all of the original high schools opened in post-World War II Europe are now closed, although many other DoDDS high schools have opened since then. The original six high schools opened in Germany were Berlin, Bremen, Frankfurt, Heidelberg, Munich and Nurnberg. All six American High Schools opened in Germany in September/October 1946. DoDDS also operates Kubasaki High School on Okinawa, Japan, Nile C. Kinnick High School in Yokosuka, Japan (formerly Yokohama High School), and W.T. Sampson High School in Cuba. 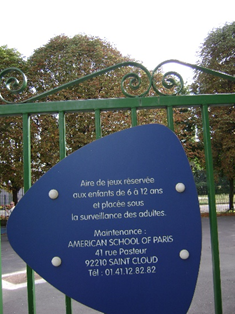 The story of Paris American High School (PAHS) is actually a story of two schools – the American Community School (ACS) and Paris American High School. 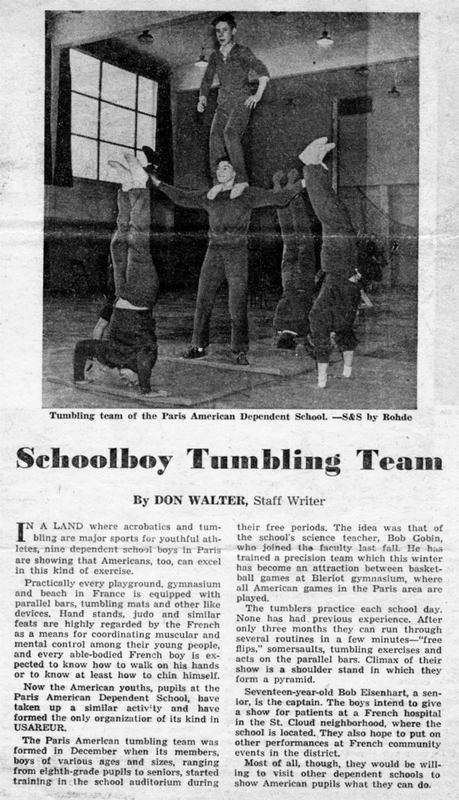 Founded in 1946, a school called the American Community School of Paris (ACS) was open for the children of those American military families who arrived in Paris in the pioneering aftermath of the Second World War. 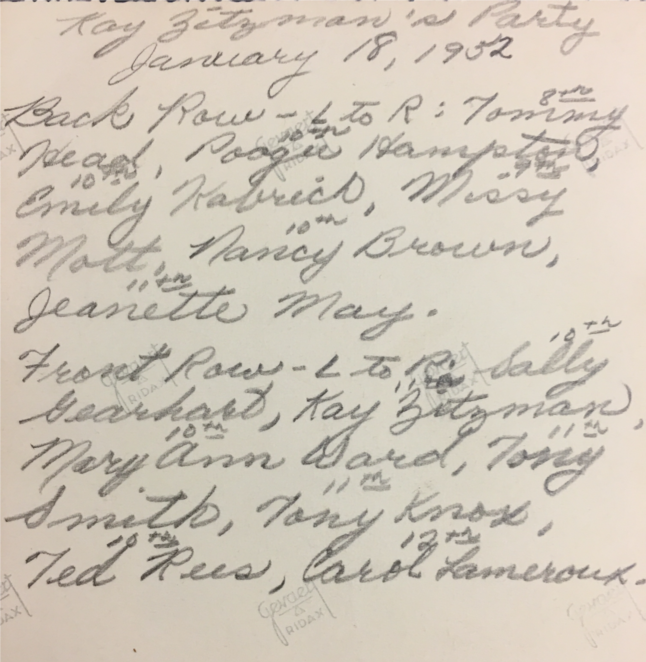 There can be some confusion among the names of the schools involved in the history of PAHS as the American Community School later became the American School of Paris. ACS, now the ASP, was the very first international school established in Europe and remains the only American school in France. From 1959 until 1967, the ASP was located in Louveciennes, a suburb of Paris, between Saint Germain en Laye and Versailles. The original Paris American High School was established at 53 Rue de la Faisanderie. This is a photo of the school taken in 1954. In 1946, not all classes were located together at the same location. The Elementary School was in a series of trailer homes west of Rue de la Machine. The Middle School was located nearby in a French manor house, and the High School was located in the famous home of the French courtesan/king's mistress - Madame Du Barry! In 1951 the school was relocated at 3 -4 Rue Cimarosa. In 1959, the house was bought by the American School of Paris, which then settled there. Construction of the new Paris American High School (PAHS) began in mid to late 1952 and the school was opened in September 1954 in Garches, a western suburb of Paris. The new elementary school building was a large two-story structure with perhaps 40 classrooms, situated on a large undeveloped playground. Next to it was an equally large two-story high school facility, a cafeteria building, a gymnasium and 2 two-story dormitories for students who commuted to PAHS from distant locations. The school continued to grow over the years to accommodate the 185 dormitory students resulting from the increased dependent population of the EUCOM Headquarters located at Camp des Loges. A new wing, completed In January 1963, provided such innovations as specially constructed rooms for vocal and instrumental music. 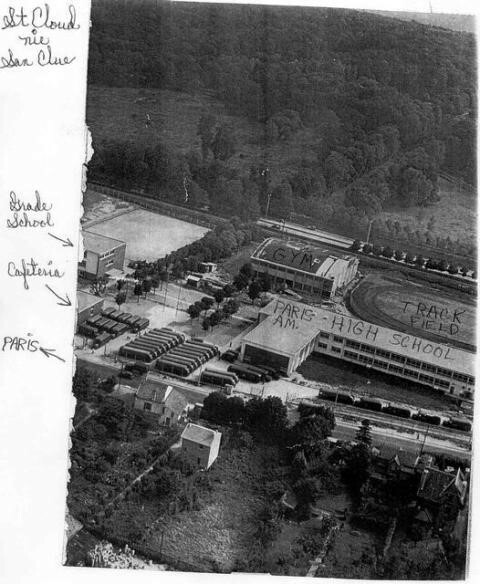 Mr. Bruce Taft (last PAHS Principal) provided the following overhead photograph of PAHS at the Garches site, complete with those old green Army school buses in the parking lot. Date of the photograph is unknown. 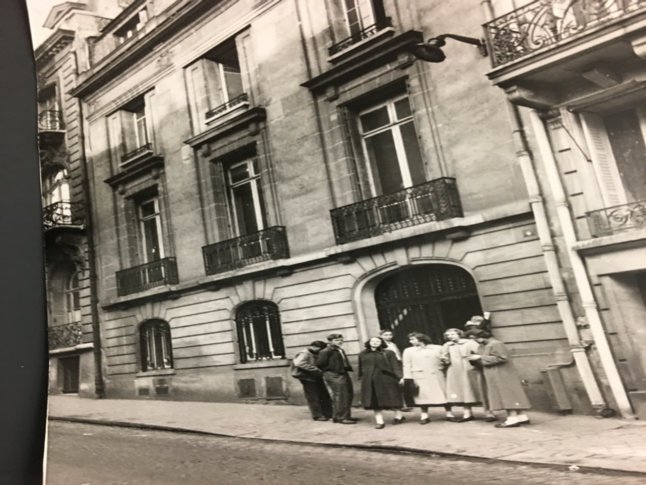 It might be interesting to some to note that the author’s first home upon arrival in Paris in 1955 is visible in this photograph directly across the street from the school. It made getting to class in the morning very easy! 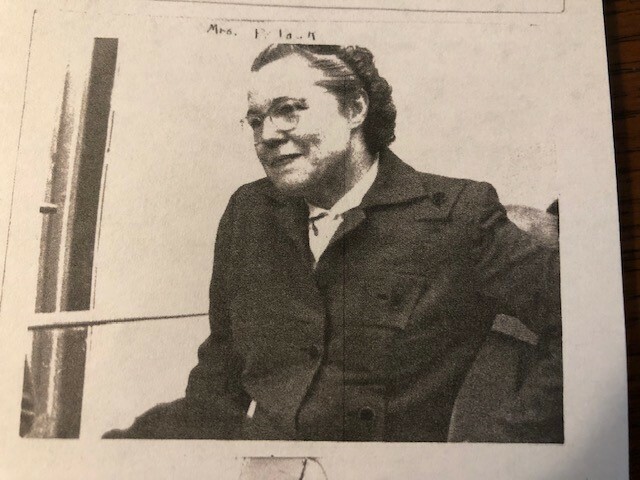 In 1954 the principal of the elementary school was Ms. Jean Mathews Littlefield, who ran a tight ship and had the respect and cooperation of all the teachers. 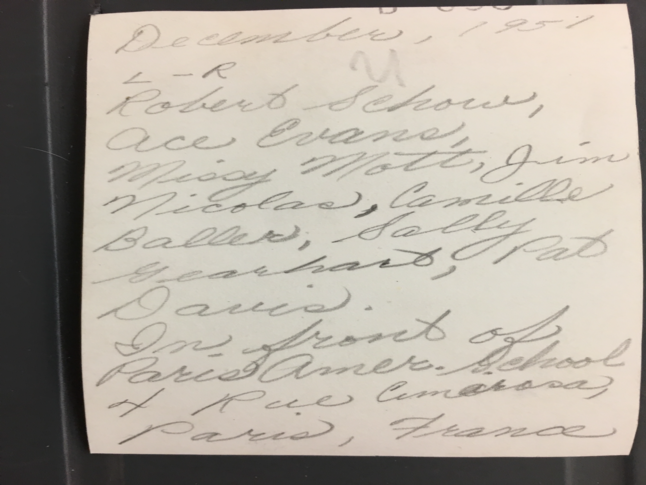 Some of the teachers who were assigned to Paris American in 1954 and later years were: Bill Lutz, Bill Horn, Barbara Barkman, Cecil Driver, Cherie Jova Campbell, and Bob and Nora Serra. Teachers were responsible for their own housing on the local economy, as well as for their medical needs. Of course, in those early years, the PX along the Seine was a very popular spot for all American personnel. The salary for a teacher in 1954, as a GS-7, was $4,205 per year. Virtually all the students in the school commuted by school bus and every afternoon, some 100 buses were lined up to deliver the students to every corner of Paris and its environs. Carole (Kelley) Lowell (‘52): School opened on Oct. 8, 1951 in a home. Eight weeks later we moved into another home that had been updated for us at 3 Rue Cimarosa. It had 6 classrooms, a library, a study hall, and a faculty room. 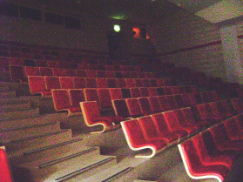 The study hall was large and doubled as an auditorium. Usually we left campus for lunch and went to a sidewalk café across the street and ate croissants and drank cokes. We used the American Community Church gym for PE, etc. At that time there were only 50 students. The Army provided buses for transportation but some of us had the privilege of staff cars. We were really spread-out all-over Paris. Our Jr/Sr prom was at SHAPE headquarters and included an elaborate banquet. We often wandered the streets of Paris, at night, in groups - “Holy Cow if we were to do that today!” The metro was our favorite means of transportation. We had an annual that first year which was combined with the other nine schools located in Europe that were sponsored by EUCOM. Our graduation was not until July as we started so late. I do not believe Petit Beauregard was built when we were there but we did shop at the PX and commissary located at Camp Des Loges. At that time, we girls wore saddle oxfords and white socks which the French found very humorous. The biggest joke on us was that we also wore gold ankle bracelets. We later found out, from someone’s driver, that in Paris, this indicated a licensed prostitute! By then we had learned enough street French to know what they were laughing at as we walked along the streets of Paris. There were only five of us in the class of 1952 – Alice Mott Criswell, Earl Nesbitt, Beth Lewis Tommy Barr and me. Our teachers tried to make everything as American an experience as possible – we even had class rings. We held a few dances and parties, mostly in homes organized by parents. We had an absolutely fantastic basketball team, played in a couple of tournaments in Frankfurt and rode the train there (wow – that was fun!). Alice and I were cheerleaders. Our colors were red and black and we were named PIRATES. Craig Stubblebine (’53) - The history of PAHS on our web site contains a contribution from Carole (Kelley) Lowell (’52). Carole makes the point that in the years of 1951 - 1952, the school was located on the Rue Cimarosa at #3 (off of the Avenue Kleber). However, my recollection is that it was the school’s administrative offices (and perhaps the grade school) that were located at #3 and that the high school classes were held across the street at #4. We did not move to Rue de la Faisanderie until fall 1952. We understood the school building at Rue de la Faisanderie to have been the home of an opera singer — by way of explanation for the rooms. I find it ironic that #53 on Rue de la Faisanderie is now the Iranian embassy — who would have thunk it? While I long ago lost my annuals in a move, I suggest you review year books as they might capture some of the notable events of those years and provide some insight into our respective characters and aspirations. The Nesbitts (Katie (’53) and Robert (’54) became doctors (as I recall), Tony Smith (’53) and Brad Hosmer (’54) went to the academies and both had distinguished records. Both did well as career officers. Alice Mott (’52) went to the CIA. Nancy Brown (Tull) (’54): I attended PAS from the first day in 1951 until March 1953. Thanks to your encouragement, while some of my family was here, we went to the "memories" trunk and dug out my high school photo album. I am glad we did - no sign of insects or rodents, but someone had not treated it kindly - something spilled, pages torn etc. (so sad!) I have included some photos of classes in those early years. Hope you find room for them. Sally (Gearhart) Gillmore (‘54): The summer of 1951 was extremely long. We had arrived for a new assignment, found there was no military base housing, and each family found rentals far and wide in the great city of Paris. School finally opened on October 8, 1951. The pictures I found in my photo album show some of our activities. 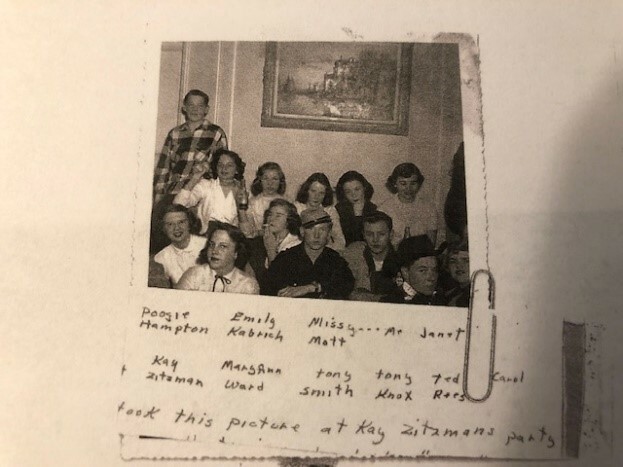 Amazingly, date of photo and names of students are on the back of the photos! We numbered 14 in the Sophomore class. Note that the address of this building is 4 Rue Cimarosa, picture dated December 1951. It was a long block to the Etoile, and was off of Avenue Kleber. The reason it was labeled Paris American School was that all grades attended here. We were gathered from our homes all over the city by government olive green sedans. I lived in Malakoff, a close southern suburb about a mile from nearest end-of-line Metro. The Principal was Dr. Richard Johnston who served 1952-53 school year and 1953-54 school year. Miss Jean Mathews was principal in 1951-52 (I think). Ms. Mildred Linck was the principal from 1954 to 1963 or 1964. 1956 Bob Eisenhart (’56): My year at PAHS was my senior year. Since I lived in Paris, I was one of those who had a long bus ride to get to school. Fortunately, I had just received my driver’s license before I left the States because having a car for other school activities was essential, and we had discovered the VW and purchased one as a second car. Getting to know the others in my class was easier than in previous schools because most of them were new to the school as well. We only had 46 in our senior class. I enjoyed playing on the football and tumbling teams, both with Mr. Gobin as coach. My older brother was in PAHS also as a senior, having been put back a grade due to a year of illness. He died of cancer in 1993. Looking back now I think that the two most significant impactful events from the year were: 1) Mr. Paul Coste, senior class advisor convincing me to accept the job of chairmanship for the school carnival. I had never taken on so much responsibility before and the resulting success gave me confidence going forward in life, accomplishing things that I probably would not have tried; and 2) Mr. Raymond Flowers, school counselor, recommending an excellent college with endorsement helping me get enrolled for the fall season. That college started me out with a strong engineering degree opening doors to an enjoyable career. I was fortunate to meet with Paul Coste in Paris to thank him about 40 years later, and even got to play a round of golf with him. In his retirement he was a tournament official for golf all over France and could play just about any course he wanted. I do miss the French baguette, taking a 6-inch piece and, when I got home from school filling it with peanut butter and jelly. That would be a whole meal for me now. Actually, that sounds like a good idea! Bart Bartlett (’57): We arrived in Paris in late summer of 1955 and my father rented a home directly across the street from the school! I was able to dash across the street and get to class easily. My favorite teachers were Mr. Hull who taught English Literature and Mr. Harvey who taught History. We played six-man football and won most of our games. However, our coach thought we should learn to play regular 11-man ball. So, taking up almost the entire squad, we practiced and practiced. We took a bus to Kaiserslautern, Germany to play KAHS! The score was 46 to 0! But we had a fine time! We had a fantastic basketball team and I participated on the tumbling team which performed in the auditorium. My family moved to Ville d’Avray, not far from the school but through the Parc d’ St. Cloud, were our neighbor was Maurice Chevalier! After a while I convinced my dad to let me drive the family’s second car to school - I was very popular! We held some dances in the auditorium, which on one occasion we decorated like the rooftop of some New York skyscraper and our senior prom was aboard the Bateau Mouche! Lots of travel – skied in the Alps and in Garmish, attended the Europe-wide Scout Camp near Giessen Germany and experienced so many wonderful things. I graduated in 1957 – there were a total of 60 in my graduation class! Our graduating year book was combined with all of the other EUCOM schools in Europe, so PAHS had about 30 pages – all in black and white. Patricia Foley (’60) - I was in Paris from 1953 to 1956 (I would have graduated in 1960) and we lived in Villennes during that time. I attended the 6th grade at number 2 Rue de la Faisanderie from the Fall of 1953 until June of 1954. In 1953 I was in the 6th grade. All of us in Villennes got on the same army bus. Our driver’s name was Dwayne. We would stop to pick up more kids in a couple of other villages and some from SHAPE Village. We would then go into Paris and all the buses would meet at a central point - somewhere around St. Cloud, I think. At that point it was a sort of like a Chinese fire drill! The younger kids would get on a bus to go to their school and the kids in the 8th grade thru high school boarded buses that went to Bleriot - a former airplane factory which also housed PX and commissary. Kids in grades 5, 6 and 7 were taken to 2 rue de la Faissanderie. When school was over, we repeated the exercise in reverse. When I started school, my classroom was on ground floor and the 7th grade was on the third floor. Half way through the year we switched for some reason. I seem to remember the 7th graders said it wasn't fair that they had to always walk up all the stairs!! My teacher’s name was Miss Hagopian (I loved her!). For recess we often went to play in the Bois de Boulogne! (Ooo-la-la - my kids tease me about that "weren't you special”). It was a wonderful building - demolished in the 70's and replaced with a “tres”-ugly apartment building. The building had once been the home of the Watel-Dehaynin family! The Duke of Windsor lived on that street as did many other notables. It is possible that number 2, rue de la Faissanderie belonged to Madame du Barry before the Watels - it was a pretty elite part of town. I seem to recall being told that she (or someone of her ilk) lived across the street at #3 rue de la Faissanderie "back in the day." There were some gorgeous murals on the school’s walls. I understand some of this art was removed to a museum before demo. Our first-floor classroom had a wall of mirrors on one side. When we moved upstairs, we were bad! At lunch or whenever the teacher wasn't there, we would make paper airplanes and fly them out of the window. That fun didn't last long - we got threatened with death or worse! There was also a rumor that some clandestine Army goings-on were in the basement and we were the "cover." I have nothing to substantiate this - but one never knows! In 1953, kids in grades 7, 8 and part of grade 9 were moved to the new school campus in Garches. By 1954 everyone went there. There was a separate building for the elementary school and one for junior and senior classes. There was also a cafeteria building (yay! No more bag lunches) The campus also had dorms for HS kids from bases that didn't yet have a school. Across the street was a bar/restaurant and if we hurried and were feeling brave that day, we could sneak over there and buy bread, cheese and a drink for the bus trip home. I remember my 8th grade history teacher, Mr. Horace Harvey - the best teacher I ever had. I also had an English teacher - Mr. Hull who was very good. To the best of my memory we had only one Afro-American student - his name was Theotis Hall. I have nothing but wonderful memories of my time in France. I cried for a week when we left! We returned to the northern Virginia area and I went to Wakefield High School. A couple of kids from my Paris years showed up and 2 of us graduated in 1960. One of them (George Deverall) was killed in Viet Nam. I've visited his grave at Arlington. Another moved to Arizona (Patty Hawkins) but have not been in touch for years. The third PAHS alum moved before graduation but I have no idea as to where they went. Two other PAHS kids who were older then I, (Roland ‘56 and Jon Wolf ‘58) were also at Wakefield (our parents were friends) but I have no contact there either. Another boy who lived in Villennes was also killed in Viet Nam - Robin Cassell (’60). Keith Murray (’61): I lived in the dorm and commuted from Fontainebleau, about 60 miles, arriving at PAHS each Monday morning and returning each Friday afternoon after class. Kids from many places in France were dorm students at PAHS while I was there, including kids from Dreux and Evreux air bases. In 1960 schools were opened for these kids in their locations, so they did not graduate with us. By 1960 the only “dorm rats” were from Fontainebleau. Ms. Mildred Linck was the principal for my three years and Mr. Frank _____ was the vice principal. Some of the teachers I remember well were: Mr. John Hull (English), Ms. DiOrio (French), and Mr. John Hull (Physics and Track). I was the trainer for both football and basketball teams in my senior year as well as President of the Student Council. Hank Dittman (who lived in the author’s house as pointed out above) and I did a “news alert” over the PA system at lunch time every day. In my junior year we held the Junior/Senior Prom at the Hotel Georges V with the Air Force dance band performing. John Foxworth and Diana Gray were crowned as class King and Queen that year. 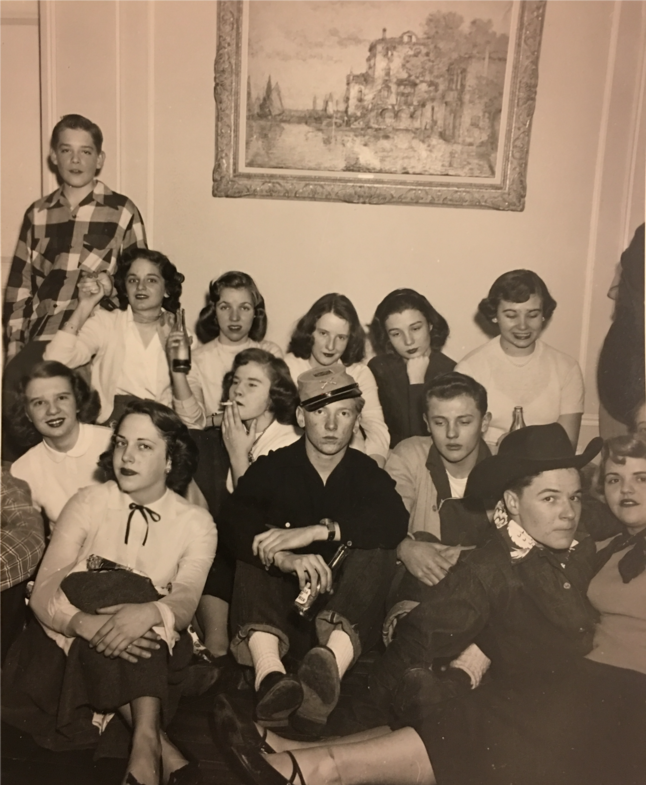 Mike Kanze (’65): The class of 63-64 held a Sweetheart Dance with the theme L’Amour de Paris – not sure but probably in the smelly old gym as well as a Hootenanny with a hillbilly theme and costumes in the auditorium. The Junior Prom was held in the grand ballroom of the Hotel Georges V with a theme of Sous le Ciel de Paris! Barbara Timmer (’65): We lived in Petit Beauregard and took the bus to and from school. We could walk to Bel Manoir. We didn’t shop at the Embassy PX, but years later my youngest brother was stationed at the Embassy as a foreign service officer. When my parents visited Paris, they found that the head of protocol at the Embassy was one of my French teachers at PAHS, Madame Cardinet!!! Yes, the American Hospital existed, still does. I remember when the French forces captured Ben Bella, one of the leaders of the Algerian resistance, he was injured during the fight, and was treated at the hospital. I remember seeing armed guards standing on the steps as we passed by in the bus. Every summer I took classes at the Alliance Française with Clare Conrad. We took a military shuttle bus to classes and ate lunched at the officer’s club on Rue Marbeuf – we felt quite grownup! I still feel like Paris is the city where I grew up and still feel at home there. I liked all my teachers except two - a math teacher who asked why I (as a girl) was in algebra two (so I left) and a history teacher whose name I forget. I had a problem or two with the vice principal. I had a great art teacher who napped on a table in the classroom during lunch hour with his door locked. I had a great P.E. teacher who taught us how to play tennis as a team. Barbara (Walker) Bartlett: I attended PAHS 1965-1967, and was part of the exodus out of France in the spring of 1967 to Stuttgart Germany, to which EUCOM moved. Some students went back to the states, some went to Brussels with SHAPE and some went to Stuttgart (Ludwigsburg American High School). It was as if a giant chasm split the beloved school right down the middle. The principal 1965-66 was Mr. Charles Curry, 1966-1967, and Mr. Bruce Taft was the Assistant principal. 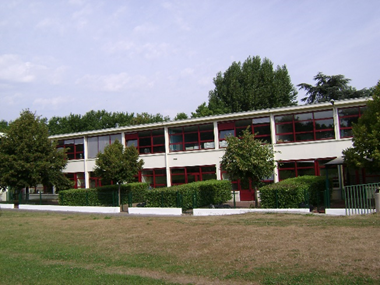 When the school closed in 1967, the American School of Paris (ASP), which had originally been the American Community School, moved to its current location in Garches. Taking over the site of what we know as the Paris American High School, ASP's campus now covers a total of 10 acres, a few kilometers from the center of Paris. In April 2006, a flash flood devastated a large portion of the Garches school campus and ravaged several classrooms and facilities. In the wake of the flood, a new capital campaign was launched to completely renovate and upgrade these facilities, culminating with the reopening of a refurbished Lower School and a state-of-the-art Performing Arts Center. Paris American High School (and the elementary school) closed in 1967 and the students moved with NATO and SHAPE to either Belgium or to Stuttgart Germany. In 2009 my wife (who was in the class that experienced this separation in 1967) and I visited the American School of Paris (ASP) now a private international school for diplomatic and corporate children. Fearful of what we might find (things are never the way we remember them), we were delighted to discover our beloved school had not been allowed to fall into disrepair as many other DODDS schools have in other worldwide locations. We were given a personal guided tour of the school by the assistant headmaster and marveled at the many new facilities. The new ASP campus occupies the same area as did our PAHS but without the chain link fence and with many new buildings. During our visit we found that the previous buildings which had once been the Paris American Elementary School are now fenced off and these are now the Santos Lycée d’Enseignement, a French public educational facility for technical and professional education. The western portion of the campus, what used to be the high school buildings, are now a beautiful campus for the ASP. The ASP campus now has a beautifully landscaped campus and well-appointed and equipped classrooms. The old chain link fence that separated the school from the busy Rue Pasteur street is gone – replaced by a beautiful tall wrought iron fence painted green and which has a manned guard post at the single point of entry. Inside the main building which contains the upper school, the wall lockers are gone as are all the old white washed, cinder block which were exposed in the hallways! 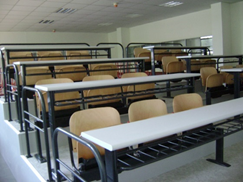 The classrooms on the lower floor of the main building all have doors which lead out to well-manicured open areas and all have stadium seating for the students. The science laboratories have new, modern equipment and the lab table stations that look as though they came from scientific venues. The auditorium has been totally remodeled with floor to ceiling theater-type seating, a new stage with an updated sound and lighting systems. The old dormitory buildings are no longer used as dorms, but are now either classrooms, laboratories or teacher offices. The track and football field in back of the school is gone! It has been replaced by three soccer fields and a softball diamond. The gym is in place and has been totally renovated and a new one built at the other end of the campus. Here are a couple of photos from our visit. three soccer fields and a softball diamond. Classrooms on the lower floor of the high school building have been modernized and each one has a door leading to landscaped outdoor play or study areas.